Never lose a coin again! The Leather Women’s Zipper Coin Pocket Wallet will ensure that every last one of your hard-earned cents stays with you. Cuteness and security never looked so good. If you’re the type of girl who likes to travel light, or maybe just need something to organize all your dollars or cards for a trip to the store, this is perfect for you. This wallet contains over ten internal compartments secured by a clutch, a fold system and a zipper! Now, if that’s not safe, nothing is. There is also a secret compartment for extra sensitive material because a modern lady always has her things she needs kept privately. For a fun addition, this wallet that can fit nice and snug in a woman’s hand comes with a cute tassel and chain decoration because a girl’s accessories are never boring. Occasion: daily occasion, travel, shopping…. Check out our women’s bags. Exactly like in the pictures, high quality wallet, even smell like true leather, no doubt. 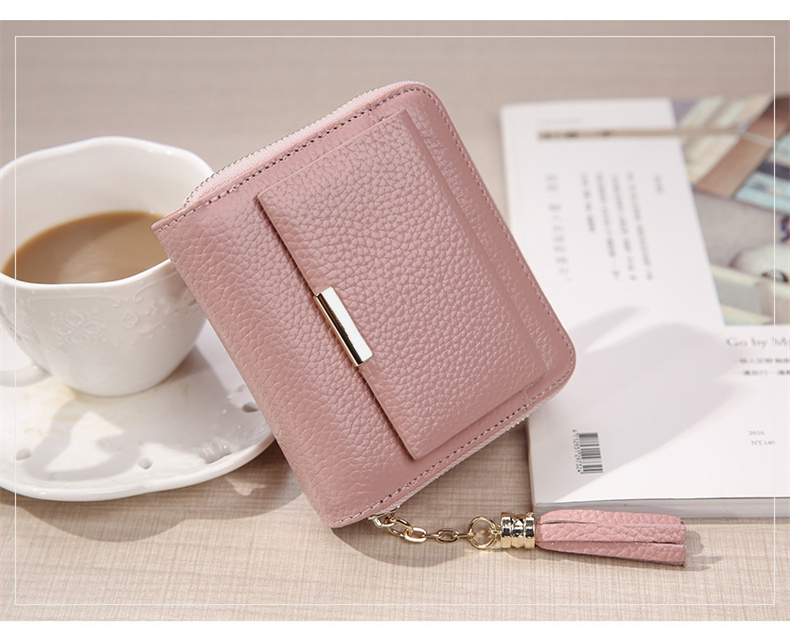 Gorgeous pink color, very elegant and compact and suprisingly has a lot of room, all my cards and coins fit inside even from a lot bigger wallet I previously had. Highly recommned this wallet and this store, order arrived very fast, only 10 business days. Very pleased and happy, thank you! Nice wallet, the photo and description, arrived very quickly, in a gift handkerchief. Thank you shop, very nice! Come in Tver in 7 days!!!! Packed well, enclosed gift shawl, got a piece of skin. The quality of such rules, see how to wear. To look like, but the color would be more tender, think red looks better. Delivery fast, packed very well!!!! Full compliance with the description of the store. Good quality. Beautiful Bright color! Gift handkerchief, nice. Recommend!!!! Purse good quality. Order came in Moscow for 10 days.